I did not take an ordinary path to becoming a writer, if there is such a thing. Instead, I was both foolish and brave in equal measure. I have a gypsy's trajectory. I spent my early years in Haiti where I was born; I lived on a tiny wooden sailboat at the age of 17 and traveled into a dangerous secret war in Central America; I followed a circus; I traveled to Tashkent by train from Moscow across Kazakhstan and Uzbekistan as the Soviet Union was crumbling; I renovated and lived in a houseboat in Amsterdam and then traveled through Europe; I spent time in a Buddhist monastery in Korea, and studied Japanese women poets of the 11th century in Kyoto. For over twenty years France has been my home. I have collected stories along the way, but it was here that I got to know my French family and found my deepest inspiration. When I finally settled down in Provence I discovered some of the most moving stories I had ever heard from my own family. I have written poetry, children's books, short stories, and essays, but my current project, the story of my tante Helene is my first long-form creative non-fiction piece. My first book of poems, Trail of Stones, with illustrations by Anthony Browne was published in 1990 by Knopf in New York and Walker Books in London. Poems from this collection have been widely anthologized and turned into a theatrical production in Germany and Luxemburg. Publisher's Weekly reviewed it as a "stunning collection." My second book, The Night Shimmy, (Knopf, 1991) a children's book with the same illustrator has been translated into seven languages. Last year, it was published in Chinese. It is still in print. My third children's book Ruth and the Greenbook (Lerner, 2010) received awards and recognition including the ALA 2011 Most Notable Middle Grade Reader, Whitney and Scott Cordozo Award for Children's Literature, Honor book for the Jane Adam's Peace Prize, and most recently was named "one of ten books all Georgians should read" the Georgia Advisory Book Council. It is currently on its 14th edition. My most recent book The Hiding Game, a Middle Grade Reader, won a 2017 Parent's Choice Award. Jane Yolen, author of The Devil's Arithmetic, said, "The Hiding Game... is riveting, the truth undeniable, the heroes all but forgotten. A picture book not to be missed." And the Kirkus Review called it, "Gripping and intense." The Hiding Game tells the story of my great Uncle Danny Bénédite and how working with Varian Fry in Marseille, in 1940-41, he helped save over 2000 artists, writers, scientists, scholars escape from the Nazis. Danny went on to be a leader in the Resistance and years after the war he married my tante Helene. I have also been lucky to get my poetry, essays, and short stories published in numerous literary magazine and outlets including: Catapult, The New Republic, New England Review, Kenyon Review, London Sunday Times and Antioch Review. 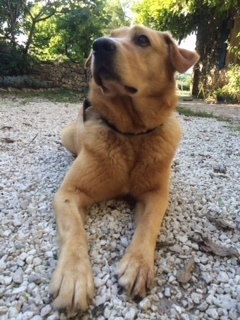 Since 2005, I have lived in Southern France with my three children and dog Zola, where I work as the Director of the Brown Foundation Fellowship Program at the Dora Maar House, an artist residency program. The house was purchased by Picasso as a "break-up gift" for his mistress Dora Maar. She lived here until her death in 1997, when it was converted into a international residency program. My job allows me to meet and interact with artists, writers and thinkers from around the world. I live in one of the most beautiful corners of the world, have a highly inspiring job and still I get to write in the morning in my garden shed, that I converted (inspired by Roald Dalh) into a writer's room. The Year's Best Fantasy and Horror, Fourth Annual Collection, Ellen Datlow and Teri Windling, eds., Endicott, 1990. Conch Salad was the prizewinner in the WICE-Paris Transcontinental short story contest.